^ "Literature, Bowling, and the Labor Day Group" Archived 2008年7月6日, at the Wayback Machine. Essay by GRRM discussing his status as a member of the "Labour Day Group." Retrieved on 2007-11-03. ^ Turtledove, Harry, ed, with Martin H. Greenberg. The Best Military Science Fiction of the 20th Century. New York: Ballantine, 2001-5, p. 279-306. ^ A Feast for Crows award nominations Archived 2007年4月29日, at the Wayback Machine. 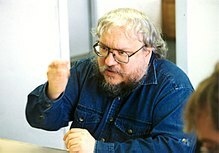 ^ George R. R. Martin: Official website Archived 2007年1月15日, at the Wayback Machine. Retrieved on 2007-11-03. ^ LiveJournal post by grrm, putatively George R. R. Martin. Retrieved on 2007-11-03. ^ "The American Tolkien" by Lev Grossman, a Times article on Martin. Retrieved on 2007-11-03. ^ T. M. Wagner. (2003),Review of A Storm of Swords. Retrieved on 2007-11-03. ^ The Inchoatus Group. (2004-08-21), Review of A Game of Thrones Archived 2008年3月25日, at the Wayback Machine.. Retrieved on 2007-11-03. ^ "A Welcome From George" Archived 2005年12月14日, at the Wayback Machine.. Bwfanclub.com. Retrieved on 2007-11-03. ^ BwBfanclub.com. "Members" Archived 2008年4月17日, at the Wayback Machine.. Retrieved on 2007-11-03. ^ "George R. R. Martin: Zines, copyright and Creative Commons"
^ (1999-05-09), The Citadel. Westeros.org. Retrieved on 2007-11-03.